At Growing with Science blog this week, I’ve teamed up with Sarah at Share It! Science for a week long tribute to STE(A)M. Today we are focusing on math. Sarah is looking at the golden ratio in her garden and I am reviewing the You Do The Math series. The expert team of Hilary Koll and Steve Mills have developed a unique series of math books illustrated by Vladimir Aleksic. Each feature gritty, real world applications of math with problems to solve embedded within the story. The challenges vary in difficulty and math skills needed. 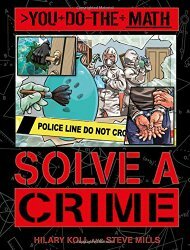 In Solve a Crime Alex, an undercover police detective, shows how math can help catch a criminal. For example, on one page the reader is asked to use co-ordinates to map the evidence and then look on a grid to calculate the distance between certain items. Fly a Jet Fighter follows pilot Katie as she handles data, interprets tables, and reads dials and scales. 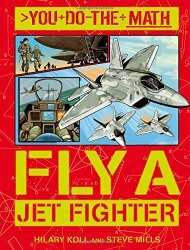 The goal is to create a squadron of jet fighter aces and complete the mission. 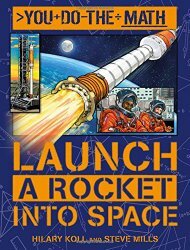 Launch a Rocket into Space follows each stage of a space mission to make sure the rocket blasts clear of the atmosphere and returns safely. It features astronaut Michael who helps the reader compete the math exercises and learn about everything from fractions to timelines. A few problems will require a protractor to measure angles. The questions in these books are real math and will require a pencil and piece of paper to do the work. “What About This” sidebars on most pages give more challenging problems, as well. Fortunately the answers for all the questions are in the back matter. The graphic-novel-style illustrations are bold and serious, adding to the true-to-life feel. Although recommended for ages 6-8, these books could also be useful for older children who are struggling with math concepts or don’t quite see how the math they are learning might be useful. The books in the You Do the Math series would be perfect for homeschoolers and after school math clubs because they can be entirely child-directed reading. They would also be useful for children researching certain careers. Stop by Growing with Science for the full review, as well as more suggestions for activities and resources to accompany the books. Booktalk: His white teacher tells her all-black class, You’ll all wind up porters and waiters. What did she know? Gordon Parks is most famous for being the first black director in Hollywood. But before he made movies and wrote books, he was a poor African American looking for work. When he bought a camera, his life changed forever. He taught himself how to take pictures and before long, people noticed. His success as a fashion photographer landed him a job working for the government. 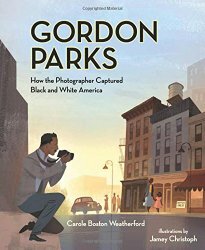 In Washington DC, Gordon went looking for a subject, but what he found was segregation. He and others were treated differently because of the color of their skin. Gordon wanted to take a stand against the racism he observed. With his camera in hand, he found a way. is the best money he will ever spend. Try one of these National Geographic Photographing Your Neighborhood ideas. Copyright © 2015 Anastasia Suen All Rights Reserved. This book will not only have you singing along, but checking an atlas, globe, or whatever mapping app you might have. It’s downright fun and a great addition to the “Over in” series that Marianne Berkes has been adding to over the years. I like it because it’s a world tour of mountain ranges – and it has animals from every region. Plus Berkes includes a handy map in case you don’t have a globe at hand. Plus it’s a counting song… so it’s win-win all around. The illustrations are beautiful cut paper, filled with texture and detail. All the animals in the book act the way that Berkes portrays them. Snow leopards leap, bald eagles soar, and penguins waddle. And they live in the mountains as shown in the book. But they don’t have as many babies as in her rhyme! There is wonderful back matter for parents and curious kids. 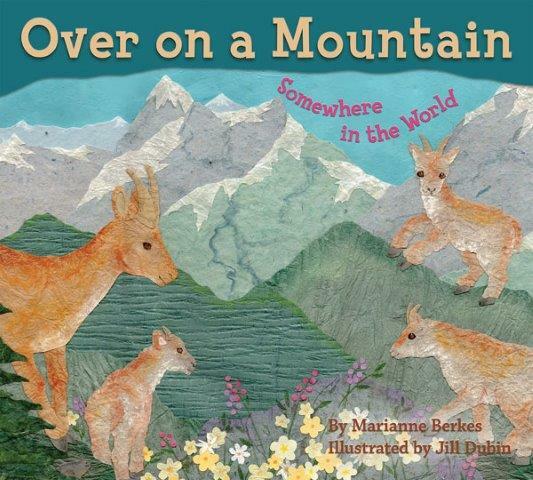 Berkes includes mountain facts, reveals the “hidden” mountain animals, and provides more information about the animals featured in the book. There’s also an entire page of “tips from the illustrator” – what fun for the budding artist! And, at the back there is music and words for the song in case you’re chosen to lead the next sing-along. I love listening to the woodpeckers in spring, as they drum on the dead trees in the woods around me. I don’t like it when they cling to the side of my house and chip away – but those are the little downy woodpeckers and they fly away when I knock on the wall. Jenkins populates his illustrations with a diversity of woodpeckers. 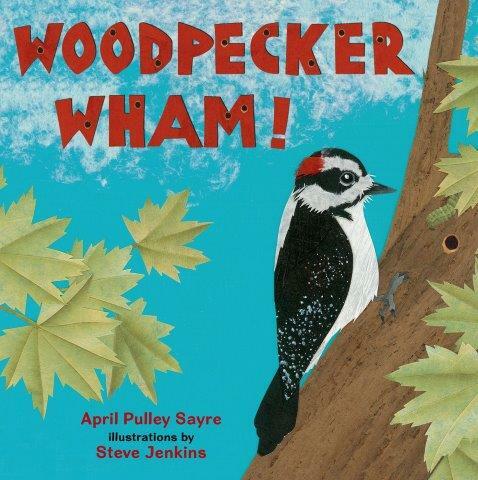 We meet red-bellied and red-headed woodpeckers, downies and sapsuckers, flickers and pileateds. I especially love the back matter – and there is plenty of it: six pages filled with info about woodpecker tongues, interesting behaviors, dining etiquette, and nest-building. There’s great information about how we can help woodpeckers by making sure they have habitat to live in, and advice about how to find a woodpecker – especially handy for those who don’t live in wood houses adjacent to forested landscapes. Booktalk: The story of the ocean is as old as the earth itself. 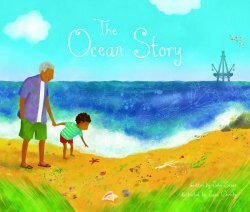 Overfishing, pollution, and oil spills have highlighted the need to take better care of our oceans so that the story can continue to be told. BOY: Why is the ocean so big? MAN: It needs to be big to hold a story that is very old. When sunlight warms your honeybee wings, off you go on flower patrol! So begins a day of adventure – and work – for this honey bee flying over a prairie. 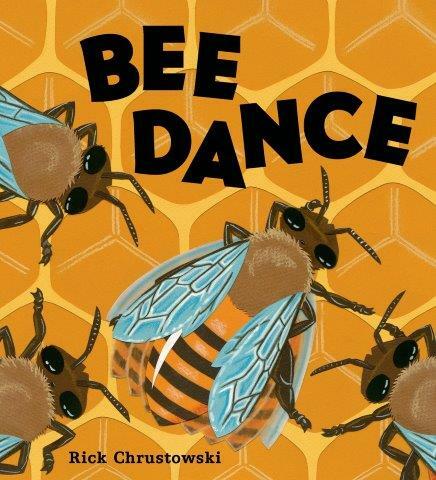 Simple language allows young readers (and listeners) to join the bee as she returns to the hive and begins the waggle dance. The description is so good that you could do the waggle dance yourself. The illustrations are multi-media: collage with pastel pencil – and from a bee’s point of view… or maybe a beetle’s point of view. From below, the stems and leaves seem huge, flowers towering above, bees coming in for a landing. And there’s an info-packed page at the back that discusses why honey bees dance. Head over to Archimedes Notebook for more about pollinators. Booktalk: What smaller scientific discoveries led up to major breakthroughs such as the assembly line, computers, or the Internet? Who first proposed ideas to solve problems? And how did the solutions change over time? 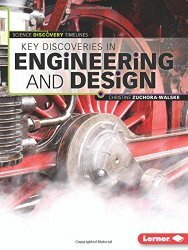 Trace the history of key discoveries in engineering and design with timelines and find out the facts. Many thousands of years ago, people tasked with raising stone structures faced a problem. How could they make openings, such as windows and doorways, in their structures without weakening them? How could they create roofs and ceilings that would support their own weight and any weight above them? Openings were important for light, ventilation, movement, and defense. Roofs and ceilings, of course, provided shelter for people and objects housed in the space below. But roofs or windows with open space beneath them ran the risk of caving in.